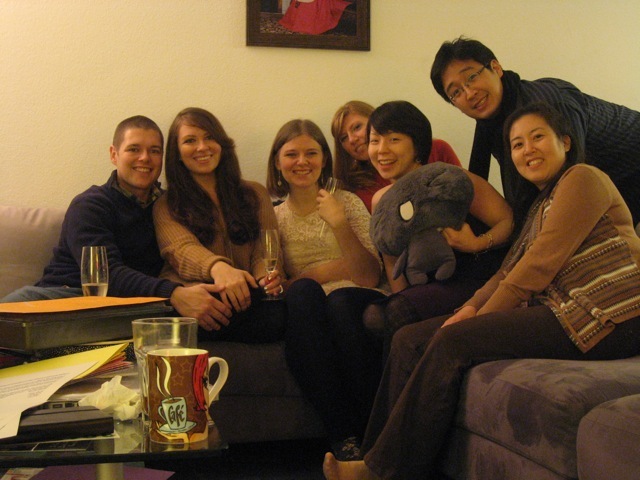 ...and we headed off to Frankfurt to ring in the New Year with friends from our international bible study group! Anyone else ever have Raclette & Fondue night? Well, if you haven't, you're missing out! Not only is playing with your food fun as heck, but anything having to do with CHEESE is high on the top of my "Oh Yeahhh!" list. 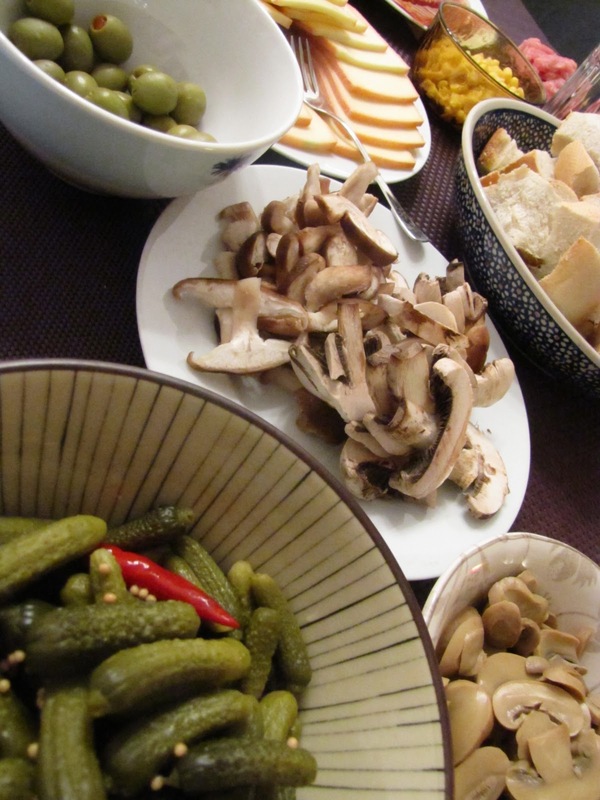 Everyone know's what Fondue entails, but Raclette...well, let me break it down for you. Raclette is dish of the Swiss & French persuasion. Back in the day, the Raclette cheese (yumtastic, by the way) was kept in it's round form and was heated, either in front of a fire or by a special machine, and then scraped onto diner's plates. 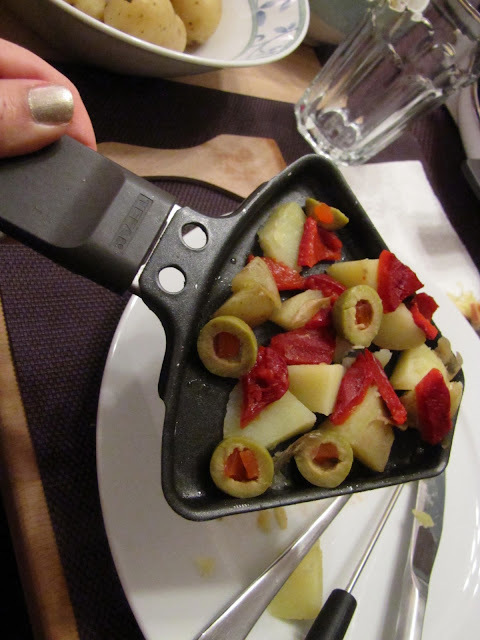 The word raclette is French derived and literally means "to scrape". 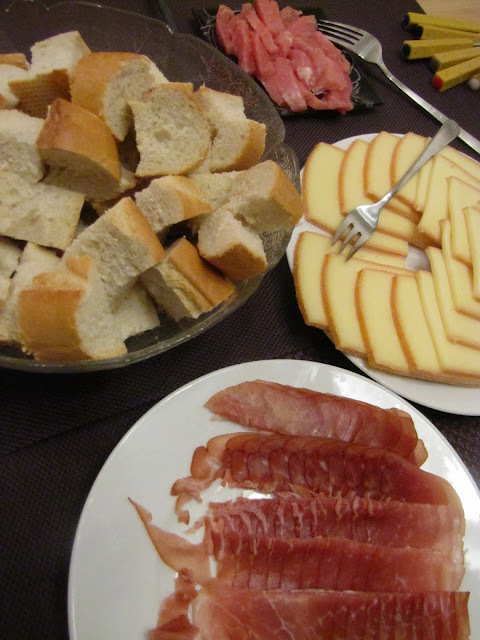 It was served with small, boiled potatoes, sweet gherkins, cured meat such as ham, and pickled onions. Today, it's been modernized a bit with the use of a nifty table top Raclette grill. In between the grill plate and the base, there is a broiler area with these cute little trays. On the trays, more commonly known as coupelles, is where you load your slice of Raclette cheese. You place it in it's designated place under the broiler and the cheese melts and gets all bubbly brown. To liven it up a bit, you can make a Raclette pizza of sorts by adding veggies, meats from the grill-top, and chopped up bits of boiled potato underneath your cheese (shown below). Voilà! Then you scrape the cheesy goodness off the tray onto your plate and enjoy! I love a good meal that you have to work for. Makes it all the more scrumptious! 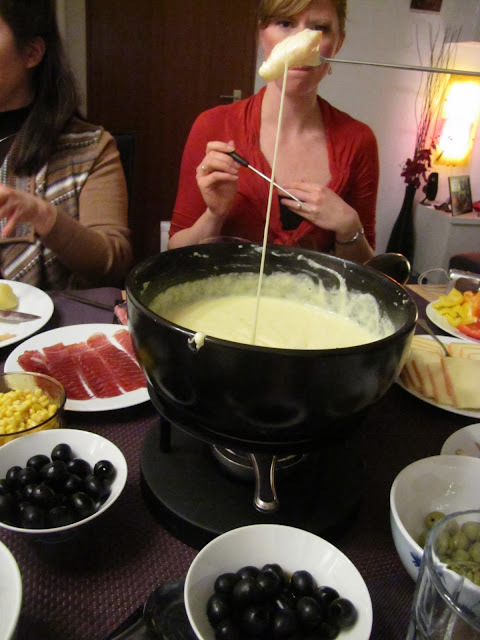 And, as if the Raclette wasn't already enough cool fooding for the night, we also had yummy fondue! This was a winner of a New Year's feast if I ever saw one. As the majority of you know, most states in the good 'ole USA count fireworks as illegal contraband, thus making firework displays at concerts, baseball games, and Disney World a sight to behold. If you're lucky enough to visit, oh let's say Myrtle Beach, SC on any given day, you could buy yourself a few poppers, a stingy bottle rocket, or a little fountain cone...but no major arsenal of wicked cool fireworks. When I heard about Germany and how German's go nutso for fireworks, I thought...Oh, so a bunch of the little aforementioned fireworks set off in open areas with minimal spectators sounds nice. Holy crapballs was I wrong. How about German's EVERYWHERE shooting off MEGA fireworks in HEAVILY POPULATED TREED AREAS! These (I say "these" because there were numerous mini firework displays going off around every square inch of the city) were not the most extravagant nor well thought out display of fireworks in the world by any stretch of the imagination. But if you weren't paying attention to your surroundings, you could have easily gotten a bottle rocket to the noggin. Thrilling, to say the least. The popping and crackling lasted a good TWO hours after we entered the New Year. D and I were literally watching our backs everywhere we walked that night. On the drive home, we drove through thick clouds of smoke and saw fireworks going up all along the Autobahn. Saying that German's love their fireworks is a serious understatement. Before leaving the Raeman house, we popped a bottle of Sekt and toasted to the New Year! And of course, I got my New Year's smooch. A little after midnight, but better late than never! I also got a text message from my Mom asking what 2012 looked like so far (because you know, I live in the future to her). I said, pretty darn fabulous, Mom. Feels like a winner. Gosh, I love that woman. 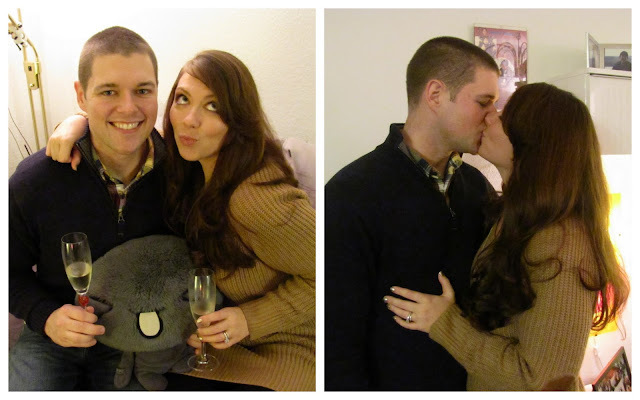 How did you guys ring in 2012? Any resolutions you want to share? I could not agree more about the sheer chaos that is fireworks in Germany. These people are insane. Glad you guys had fun! I love your outfit, it's so cute! That food looks awesome! Serious yum! Do you us WhatsApp? If that's what you're using, how did you change the color? Love that! 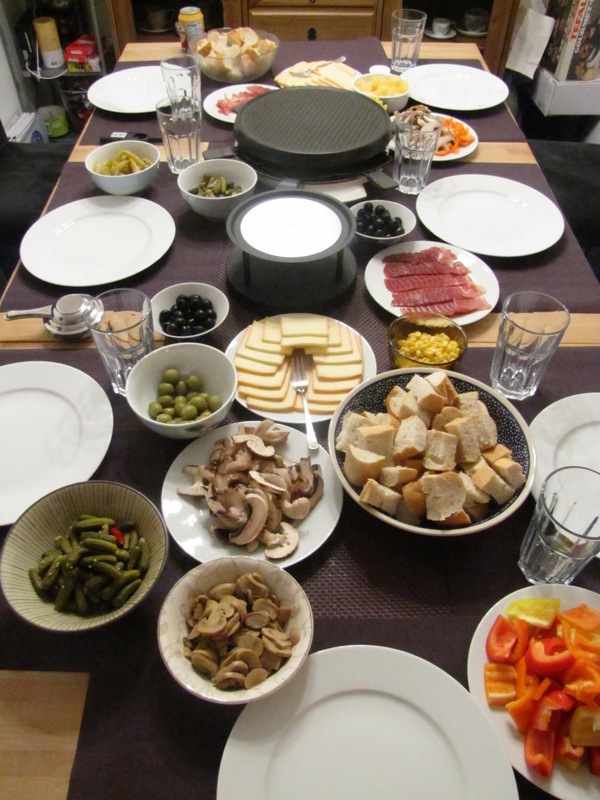 the raclette dinner looks awesome!!! Looks like you had a fabulous time! Also holy fireworks! Love it. Also please send me some cheese. yum. looks like you had a fantastic time! love your sweater! I now need a RACLETTE! Never seen one before, but I love melted cheesy goodness. Hi Casey! Found you through the iBlog4me campaign. Too cool that you're in Germany! This was my first German New Year and I too was blown away by the fireworks! I've never seen anything like it - it felt like bombs were going off all around us but it was also really neat to turn around 360 and see fireworks in every direction! Anyway, we're in Germany for the hockey season, hope to be back next year too. Can't wait to follow you!